Volleyball Scoring Systems ~ Hellow volleyball. Volleyball is a team sport played by two teams on a playing court divided by a net. The sport originated in the United States, and is now just achieving the type of popularity in the U.S. that it has received on a global basis, where it ranks behind only soccer among participation sports. Today there are more than 24 million Americans who play volleyball. 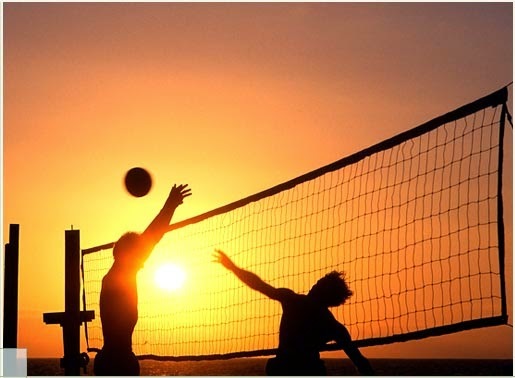 There are 800 million players worldwide who play Volleyball at least once a week. The object of the game is for each team to send the ball regularly over the net to ground it on the opponent's court, and to prevent the ball from being grounded on its own court. The ball is put into play by the right back-row player who serves the ball by hitting it over the net to the opponent's court. A team is allowed to hit the ball three times (in addition to the block contact) to return it to the opponent's court. A player is not allowed to hit the ball twice consecutively, except when attempting a block. The rally continues until the ball touches the ground/floor, goes "out" or a team fails to return it to the opponent's court or commits a fault. The team winning a rally scores a point (Rally Point System). When the receiving team wins a rally, it gains a point and the right to serve, and its players rotate one position clockwise. The best of three or best of five games will win matches. Each non-deciding game will be won by the team that first scores 25 points with a minimum two-point advantage (no scoring cap). If there is a deciding game, it will be won by the team that first scores 15 points with a minimum two-point advantage (no scoring cap). Only the serving team may score a point, except in the deciding game when rally-point scoring is used. When the receiving team wins a rally, it gains the right to serve (also scoring a point in the deciding game), and its players rotate one position clockwise. Rotatation ensures that players play at both the net and the back zone of the court. A team wins a game by scoring 15 points with a two-point advantage and wins the match by winning the best of three or five games. In the event of a 16-16 tie, the team scoring the 17th point wins a non-deciding game with only a one-point advantage. In a deciding game there is no point cap.